● Hot homestyle meals served cafeteria style-ready when you walk in the door and conveniently available for take-out or dining-in our unique venue space. With a 25-year tenure in the food industry-to include establishing himself as a popular chef, restaurateur and gourmet caterer, being voted Best Chef by the American Culinary Federation’s Baton Rouge Chapter and Baton Rouge’s Best Caterer in 225 Magazine for five years, Chef Don Bergeron, who has a Business Marketing degree, has always had his finger on the culinary pulse of the Baton Rouge community and was keenly aware of up and coming food trends. He had realized early on in his career span as a personal chefm that there was a need and a demand from customers to have healthy, yet convenient options, for eating out and at home.In 2008, he opened Mid City Market as an extension of his already successful catering business. Touting ‘fine prepared cuisine and catering to go’, the small shop featured a plethora of fresh & frozen take & bake or heat & serveitems each day, as well as cafeteria style take-out service for hot lunch & dinner options Monday–Friday and brunch on Saturdays. His hunch was correct! The concept was wildly popular and he soon justified the necessity for a larger space to accommodate dine-in customers and expanded services. Bergeron’s City Market, the newest addition to Chef Don Bergeron’s food domain, was birthed in 2016. 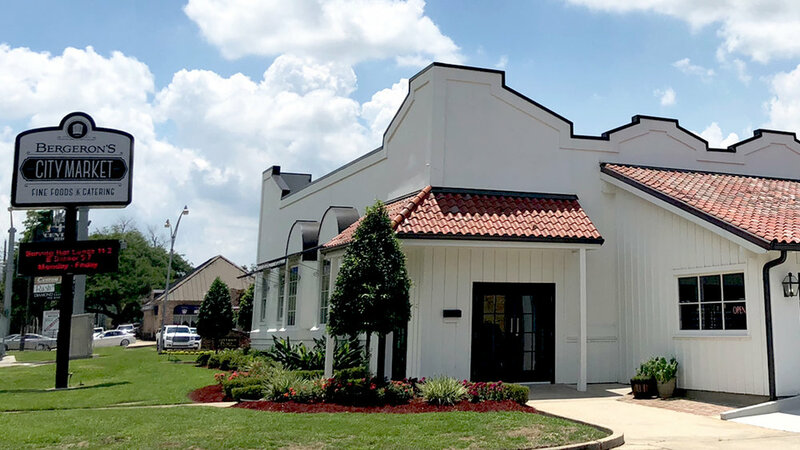 The sleek black & white building at 8200 Jefferson, in the very center of Baton Rouge, houses a retail culinary one-stopshop and cafeteria style dining room featuring an exceptional variety of fine foods to go. Open six days a week, offering unique and ever-changing, homestyle hot menu options for dine-in or take-out lunch & dinner Monday-Friday, and brunch on Saturday, the food is ready when you walk in the door! In addition, spacious coolers and freezers hold an extensive repertoire of fresh & frozen items to take & bake or heat & serve. With grab & go items from the market, like one of Bergeron’s specialty cheese tortes or City Market Chicken Salad, signature items available daily, customers are assured that on a visit to Bergeron’s City Market, they will find specialty and gourmet cuisine for any occasion…including an appealing selection of wines for any budget! Stopping in to this chic & modish eatery, you, more than likely, may find this Chef/Owner personally serving one of multiple hot entrees from the cafeteria-style dining room service. Or, even stocking the shelves in the retail market with his bottles of homemade Cane Syrup, Pepper Blend, Jams, Jellies, Preserves or his House Sensation Dressing. The property also has become an annex to enhance the catering arm of his business. Adding to his menu of a la carte services, and off-site gourmet catering, his staff is now booking private parties at the venue. Available for cocktail parties of 100 or more and seated dinners for 60, it’s just another opportunity to share with friends, families and colleagues a culinary experience autographed with Chef Don’s personal signature of excellence. There is something for everyone and every occasion at Bergeron’s City Market! Now, with an attractive and unique venue with expanded space, ample parking and convenient from every direction, this business model encapsulates the Chef’s passion to present to his customers a culinary experience on every level and every day!